Apple takes care and is well-known for seamless usage of it’s products, high build quality, and strong efforts regarding customer support. Try to get help from Samsung, HTC, LG, Sony, or other competitors and you will see the difference and it’s because Apple offers a complete ecosystem. Unlike Microsoft the company offers a powerful collection of support articles which are regularly updated. But there is also an advantage in Microsoft’s approach to organize the error messaging system. It’s the so-called MSID for errors, a unique, product related number which points to an error description. Within iOS Apple doesn’t use error numbers. As a consequence your search is only successful if you enter main parts of the message displayed on your device in a search engine. 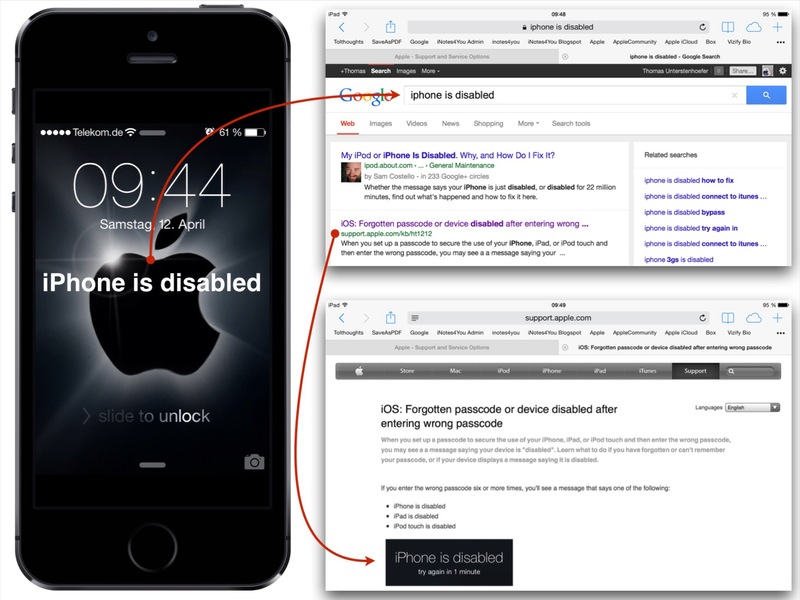 If you enter ‘iPhone disabled’ as the search term in a browser you will immediately get a high ranked result pointing to an Apple support article. It would be an improvement if iOS lets you copy the message into the clipboard for later use as the search term in a browser. A further step forward could be an optional control within an error message popup named ‘Support’. Tapping on it opens Safari with the error message as the search term. Fortunately Apple sells high quality products so that error messages are rare. Go to Settings – General – About to find it out. Tap and hold to copy the number to the clipboard. Go to Settings – General – Software Update to find it out. Go to Settings – General – About to find it out. If you want to have immediate access to all these data don’t keep it in an iWork document, instead use a password keeper like 1Password. 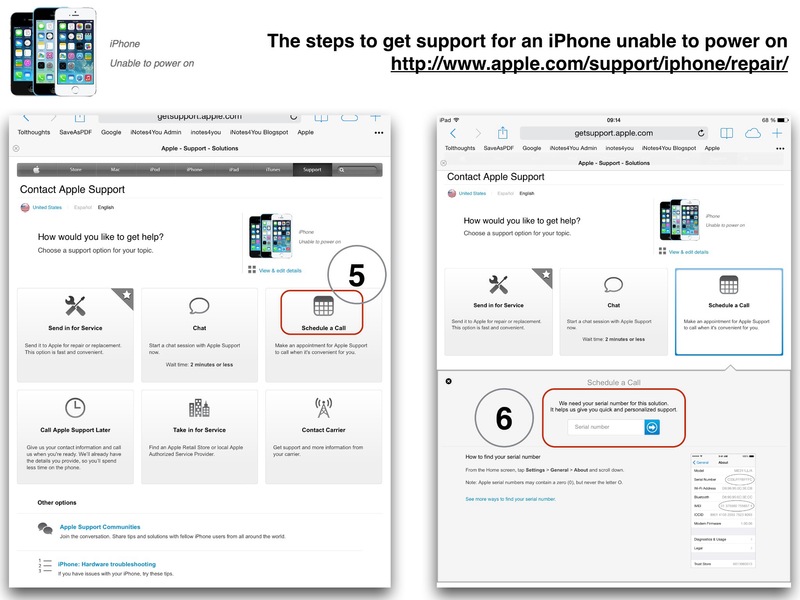 If you visit Apple’s website you will find a comprehensive overview about support options. My mind map shows these options and an overview of essential FAQs. All topics come along with assigned links. 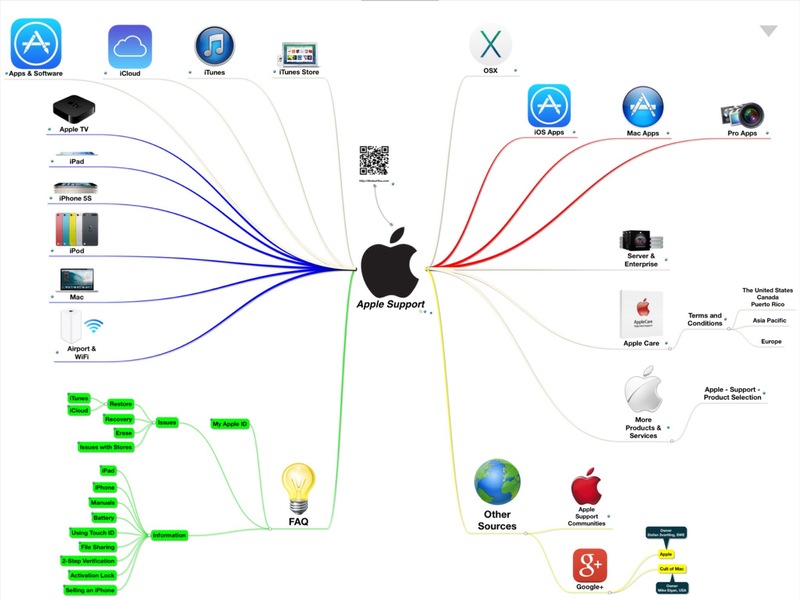 If you use a mind mapping tool just tap on a topic to open the related website. The alternative file formats have been created with iThoughts HD for iPad (.ITMZ file format). Compatibility to other tools is limited. 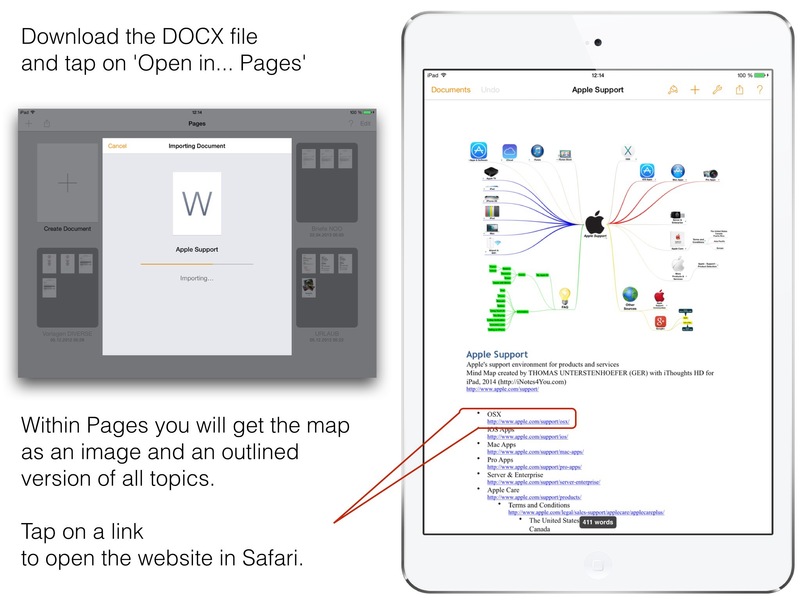 The DOCX file format is suggested for those who don’t use a mind mapping tool. The file contains the image as well as a detailed outline of all topics. Just tap on a link within Pages to open the website in Safari. It rarely happens but if a recovery of your device (the most thorough way to solve problems) doesn’t solve the problem it might be the hardware which died. Apple offers the following options to reanimate your device. Tap on ‘Service Requests + Troubleshooting’ to see a list of possible problems. Call the phone number for your country and a clerk will help you in any case, with or without an AppleCare Protection Plan. I there is a nearby Apple Store it’s the best way to take your device there. If not, use this link to see the options and contact an authorized dealer/repair service if you purchased anAppleCare Protection Plan. Here is an example of the steps to do if an iPhone won’t power on any longer. 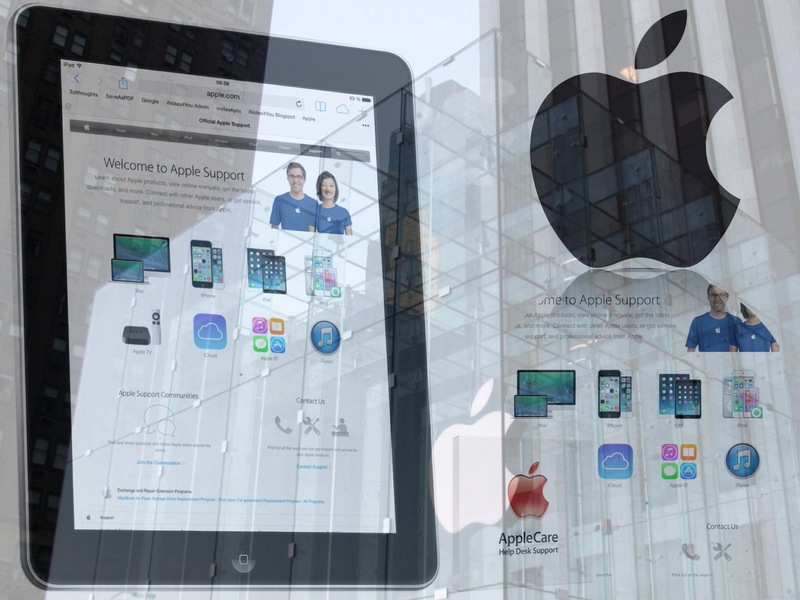 If there is an Apple Store nearby it’s always the easiest way to visit the store and take the device with you. If you have to use the mailing route Apple will send you all the printed forms you need to pack the box and temporarily say Good Bye to your electronic assistant. 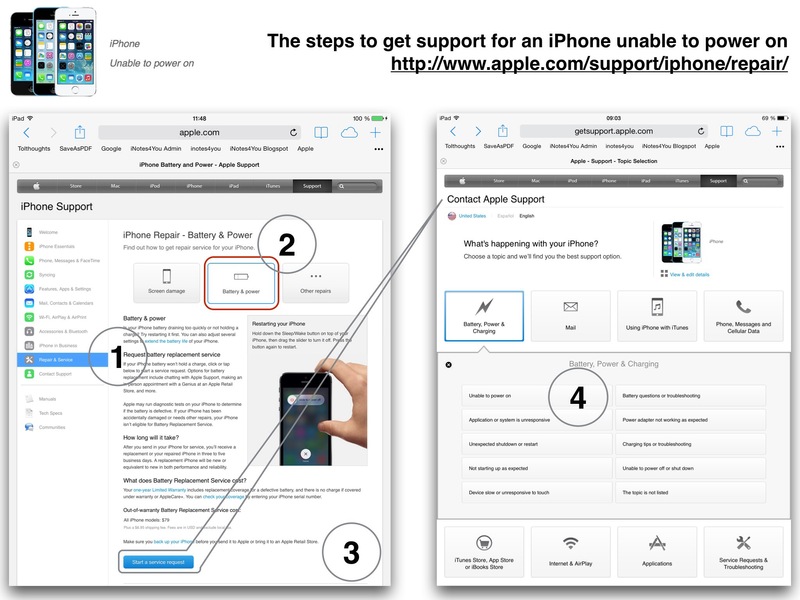 If you didn’t find an answer in one of Apple’s support documents you may ask for help in the Apple Support Community. Use this link to get started. You can quickly ask a question from the home page or from within a specific community related to products and services. You can also click New > Discussion at the top of any page. As you type your question, you’ll see a list of similar questions that other users have asked. You might find an answer in an earlier discussion. Try to limit the question to one or two short sentences. You’ll be able to provide more details in the next few steps. Choose the community that best relates to your question. Type your question and describe the issue. It’s helpful to include details such as product specs, software version, actions that cause the issue, and any troubleshooting you’ve already done. Select categories and add tags to help others find your question. To help you track responses, you’re automatically subscribed to email notifications for any question you ask or respond to. To turn off email notifications, see Manage email notifications. Encourage helpful community members by marking responses that help solve your question. This awards reputation points and increases the member’s status in the community. It also makes it easier for others to find helpful responses. If you have a question regarding an iOS device it’s likely that you find an answer or a workaround for fixing a problem within a few minutes. An iOS device usually just works. If not you fortunately have less options to solve the problem. Try a reboot, a restore or a recovery in this order. If nothing helps go to an Apple Store or send your device to Apple Repair. It’s that simple.